You have a lot of methods and steps available when applying TRIZ principles to problems and solutions. Print out this handy Cheat Sheet and keep it nearby for reference when you’re trying to come up with your next great idea. Ideality is one of the building blocks of the TRIZ logic. Defining Ideality is helpful to understanding where you currently are. You can use it to describe where you want to get to and it is essential when you are comparing options. 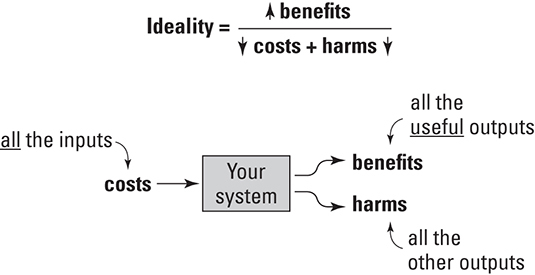 Ideality is the ratio between all the good things you want (benefits) and any downsides (costs and harms). Benefits are all good outcomes. A list of benefits is a list of all the things that you want, without any detail of how you get them (benefits cannot contain solutions). Costs are all inputs required to create your system, not just money but also time, resources and energy. Harms are all outcomes you don’t want. Nothing is neutral in TRIZ – an outcome is either wanted (and a benefit) or not (and therefore a harm). Triz is helpful when uncovering contradictions. A contradiction is when you have conflicts in what you want: either you want opposites of the same thing (a Technical Contradiction), or as you improve something, something else gets worse (a Physical Contradiction). Write down your contradiction in your own words. Identify whether you have a Technical Contradiction or a Physical Contradiction. Whatever type of contradiction you have, you will be directed to a short list of Inventive Principles: these are suggested conceptual solutions that need to be put into practice as specific ideas. The Inventive Principles are triggers for your creativity to encourage divergent thinking and generate practical real-world solutions. Look up which of the 39 Technical Parameters best describe the contradiction you have written down. Don’t agonise – select a couple of options if you’re not sure. Look up your contradiction in the Contradiction Matrix and see what Inventive Principles are suggested. Apply the relevant Inventive Principles to generate practical solutions. Identify how you can separate the things that you want – in Time, Space, on Condition or by Scale. Look up in the Separation Principles table which of the 40 Inventive Principles are most useful. Super-system & the environment: Sunlight, wind, weather, pressure, energy, temperature, any fields such as gravity, magnetism, smell, sound, and so on. System features: Size, shape, colour, transparency, weight, roughness, density, porosity, and so on. Sub-system and component resources: Use raw (as found), combine together, or modify. Harms and waste: Any outputs you don’t want, problems, causes of problems, waste of useful materials. Knowledge, experience, feelings: What knowledge and experience do you have? What attitudes, beliefs, feelings might be happening? Who are the users/customers of the system? Triz can be very helpful when you encounter problems. Whenever you face a challenge, remember to step through the problem following a logical process and use the following TRIZ tools. Triz is designed to help you with problems. Keeping that in mind, it is only helpful if you know how to approach these issues. Here are some Bad Solution Park rules that might be helpful. Whenever you have an idea, write it down – no matter how wacky, weak, impractical, outrageous or poorly developed. Everyone contributes – everyone has a pen and sticky notes and can add to the Bad Solution Park at any time. Don’t judge ideas too soon – think of constraints and practicalities later. Be positive about ideas – both your own and other people’s. Don’t get obsessed with one idea – come up with lots. Build on and improve on other people’s ideas. Capture questions, comments and problems too.